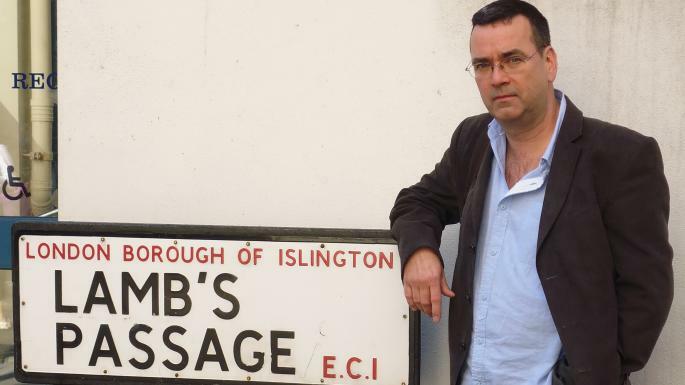 You are here: Home / Featured / Spybrary Secret Treff with Mick Herron – Agent Craggs reports in. 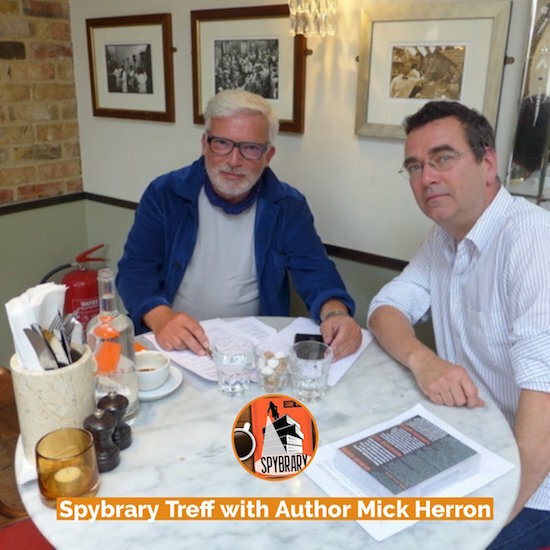 Spybrary Secret Treff with Mick Herron – Agent Craggs reports in. 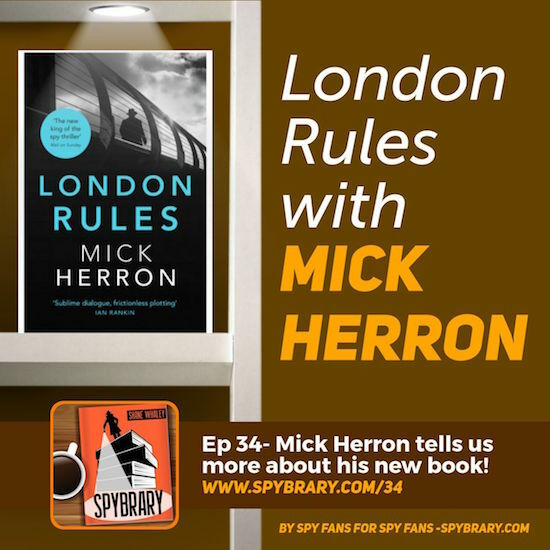 “After events in Salisbury and with the UK terror threat off the Richter scale, one could have been forgiven for thinking that lunch with Mick Herron, the award winning creator of the ‘Slough House’ novels might prove difficult. Following the Skripal affair surely he’d be way too busy to hang out with a n’er-do-well from SpyBrary ? Driving from the Surrey Hills to Oxford I fully expected the phone to ring and lunch to be canceled. Slough House would definitely have been mobilised to assist the Park with the investigation. Mick would be in the thick of it. Somebody would have to ensure that detente between Lady Di and Jackson Lamb prevailed and that they acted in the national interest. If she tried to get him to search UK perfume counters for contaminated bottles, Lamb would surely retaliate by offering the good Lady a Novichok sandwich and that would be the end of it. Mick would have to intervene. He would be way too busy for me! Happily not a bit of it. Our literary hero strode into Oxford’s Gee’s restaurant at the appointed hour surveillance free. He took the seat facing the door with his back to the wall. When I complemented him on his impeccable tradecraft he told that he just wanted to sit away from the draft. Just like Mick to underplay things. I had thought he might be stressed but to the contrary, he looked tanned, fit and very relaxed. After presenting him with that most sort after of literary accolades, ‘ The SPYBRARY’ coaster, I immediately inquired about the well being of those ‘Slow Horses’. Mick reassured me that the reprobates are on fine form and that the sixth, yet to be titled, novel in the series has progressed extremely well. It will launch in the UK in June of next year. 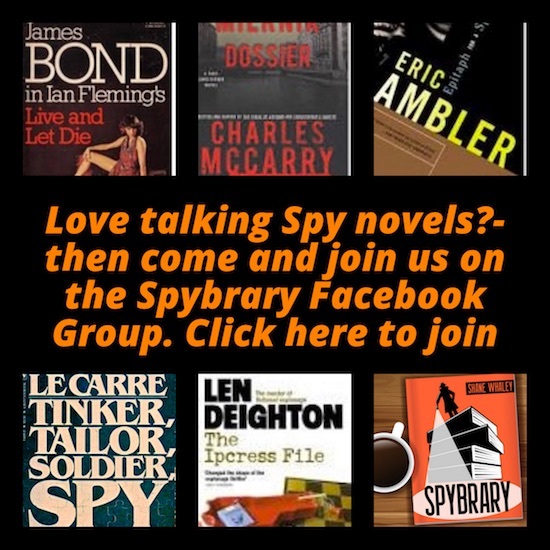 Spybrarians desperate for the next Herron fix will be delighted to know that they won’t have to wait until then to reacquaint themselves with the best rejects in the business. It will be proceeded by a prequel novella called ‘ The Drop’ which will be launched on November 1st this year and will introduce a new character to the cast ! Great news for Mick’s legions of fans. Yours truly will be first in the queue. For Spybrarians who haven’t read it, I can heartily recommend it. It is Hitchcockian in the extreme and has a great MacGuffin. He told me that he had considered doing another standalone next but feels so enthused by Slough House that he thinks he may plough strait into a seventh installment. Whatever he decides will be completely fine with this aficionado. I’d read the telephone directory if Mr. Herron were to write it ! Less positive is that Mick continues to described Jackson Lamb’s progress to the screen as “glacial” but happily mentioned that a script is in development for his Zoe Boehm thrillers. So, who knows, maybe Zoe might beat Jackson to the screen? Now that would be ironic. We then proceeded to have a three hour lunch during which we put the thriller world, past and present, to rights. Violently agreeing on some things and amicably disagreeing on others. Mick is a huge fan of a new book by Manda Scott called ‘A Treachery Of Spies‘ and couldn’t speak highly enough about it. Having read it myself, this is one we could violently agree on. It is an absolute corker and should jump to the top of any self respecting Spybrarian’s reading list. It really falls under the heading of new, different and better. She has a great voice and the whole thing is a real treat. Before parting, I wished him well with his CWA Ian Fleming 2018 Steel Dagger nomination. He won it last year with ‘Spook Street’. If anybody deserves two in a row it’s Mick but the competition is stiff and he rates the other contenders very highly. He gave a big shout out for two in particular; Attica Locke’s ‘Blue Bird‘ and Don Winslow’s ‘The Force‘. 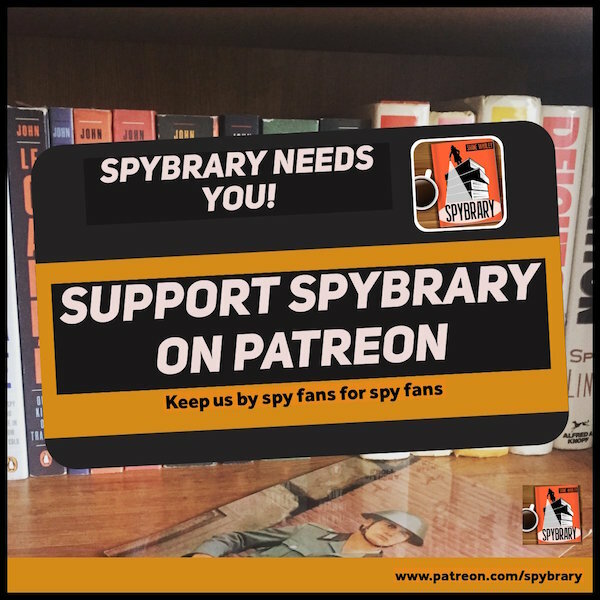 We will see what we will see but I’m sure Mick’s many fans at SPYBRARY will be rooting for him. Win a Signed Copy of the Slough House #6! 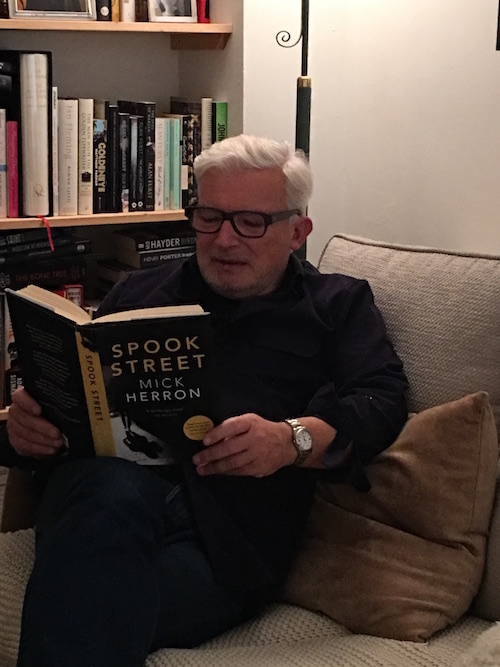 Generous to a fault, Mick Herron has offered to put up a personally dedicated signed copy of the UK edition of the new Slough House novel when it is published next year. Email Spybrary Spy Podcast host Shane Whaley with the answer to the following questions with the headline – Jackson Lamb. Draw will be made on November 5th so don’t hang about. 1) Who did Spider set up in ‘Slow Horses’ ? 2) What is Jackson Lamb’s favourite tipple ? 3) London Rules might not be written down, but everybody knows rule one. What is it ? 4) Name the ‘Slow Horse’ that doesn’t make it to the end of ‘Spook Street’ ? 5) Who is described as the PM’s favourite Muslim in ‘London Rules’ ? Leaving I reflected on what a genuine, unassuming and entertaining gentleman Mick Herron is. That said, as we strolled back to Sumertown I couldn’t help but worry about his and by association, my own safety. After all, the two GRU hitmen linked to the Skripal affair are still at large and here am I walking down the street in broad day light with the UK’s top spy master without any visible security. Checking behind, I noticed someone moving, pantherlike, between parked cars. As he closed on us I noticed the neat little goatee and baseball cap. We weren’t on our own after all. Lamb had sent the Rodster to look after us. I should have been reassured. I wasn’t, I started to run for my car ……. Happily Mick made it home safely. 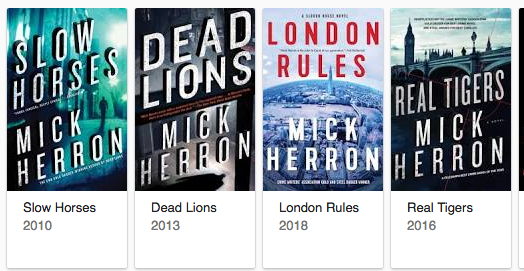 Check out all of Mick Herron’s novels on his Amazon page or in all good bookstores! You won’t regret it! Spybrary and David Craggs would like to thank Mick Herron for always taking time out of his busy schedule to chat with his fans and supporters. Please do check out his official website. It’s great when one of your literary heroes turns out to be one of the good guys.